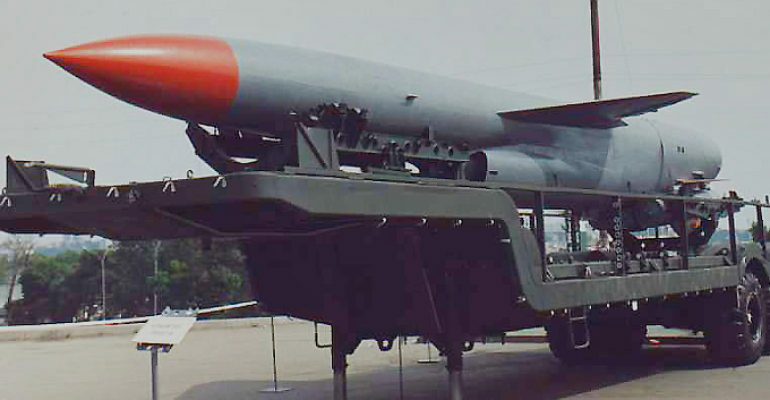 The P-500 Bazalt is a Soviet-era supersonic anti-ship cruise missile that remains active in the Russian missile arsenal today. When armed with high explosives, the Bazalt can have a conventional yield of 1000 kilograms. If armed with a nuclear warhead, the cruise missile maintains a 350 kiloton nuclear yield. It uses an inertial guidance system as well as a Terminal-Phase Active Radar Seeker and has a Circular Error Probable (CEP) of 300-700 meters. The Bazalt’s maximum effective range is 550 kilometers, traveling 50 meters above the surface to its target. The P-500 was originally intended for a Kiev-class aircraft carrier however it has been added to an Echo II-class submarine and more recently has been added to Slava-class cruiser. The P-500 Bazalt originated from the canceled P-350 and became a reliable cruise missile to add to Russia’s arsenal of anti-ship missiles. While its supersonic speeds make it a reliable weapon by modern standards, it’s effectiveness is only increased when added to a Slava-class cruiser. The Slava-class Cruiser carries an advanced version of the Bazalt with an improved guidance system as well as the ability for the missile to make midcourse maneuvers. Despite these improvements, the P-700 Granit was produced as a superior alternative to the Bazalt.